The All-In Plus is perfect for those needing to store extra equipment or who like to be organised by keeping everything in one place. Along with the main compartment, it also has a handy storage compartment for hypo treatment products or for storing other medicine like blood pressure tablets, HRTs etc (please see photo for dimensions). The All-In Plus case is ideal for school children who can have all their equipment and hypo treatments in one place, giving the teacher, child and parents daily peace of mind. These attractive cases are made from firm EVA that provides a tough, protective exterior whilst also being easy to wipe and keep clean. They come in 6 bright zip colours (Crimson Red, Burnt Orange, Sunny Yellow, Luscious Green, Sky Blue and Candy Pink) that give that extra bit of fun to the case and distinguish it from other plain, medical-looking cases. 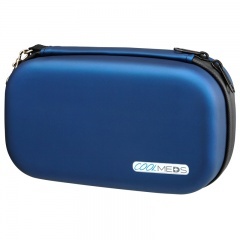 Slim and stylish Diabetic Carry Cases in a range of 4 colours.